When it comes to playing an instrument, there are numerous differences musicians should consider when comparing one instrument against another. For example, while the piano and the keyboard look similar, and may make similar sounds, they are in fact very different. When considering the differences between the piano and the keyboard. You must look at how they’re used and constructed, as well as the musical style you wish to play. The history of the piano is a long one, and early pianos can be dated back more than three hundred years ago, when Bartolomeo Cristofori, an Italian harpsichord maker produced a new mechanism that broadened the range of the instrument. His invention used hammers to hit strings to produce sound, which is how pianos still work three hundred years later. Over the years the piano developed into the instrument we know and recognize today. By most accounts the piano is considered a string instrument and it is considered to be a popular instrument and a very complex device. The keyboard, or as some call it, a digital piano, is a modern version of the pipe organ. While a piano is considered a string instrument, and makes music when a hammer hits the piano strings, a keyboard produces music digitally, and generally requires electricity to function. Musicians choosing between the piano and the keyboard should consider a few factors, for example, the range of the instrument. A piano has 88 keys (88 notes), but a typical keyboard today has only 61 or 76 keys (larger keyboards are available, but aren’t typical). On the other hand, if you plan to use your instrument to mix and record with music editing software, the keyboard offers quite a bit of flexibility and options. It should be noted, however, that many musicians prefer the sound of the piano, and insist that even the best keyboards cannot compare against the piano. In addition, a pianist can use pedals and a lighter or heavier touch to convey emotion or broaden the range of the notes. For musicians, playing the piano offers the player the chance to build finger strength over time, and also allows for finer control of sound. The piano has more than 200 strings vibrating off the sound board, which offers a wide range of sound for the musician, and that isn’t something that can be electronically imitated. Musicians should also consider the fact that a piano may retain its value over time if properly maintained. But a keyboard is reliant on technology, and as technology changes keyboards quickly become out of date. 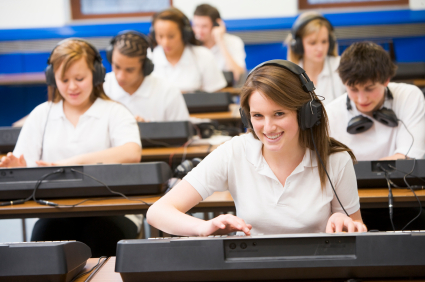 However, the keyboard is versatile, so musicians who want to play a variety of musical styles, such as modern music, may prefer it over the piano, which is generally associated with traditional styles such as classical, jazz or the blues. In addition, with the keyboard, volume can be controlled and an earphone jack can be used if the musician doesn’t want to disturb neighbors or other members of the family. The feel of the two instruments also differ. Some keyboards have small keys and feel like plastic to the touch, although a higher end model may feel more like the keys on a piano. Of course, the size of the instruments, as well as their cost, is also significantly different. Keyboards are portable and do not take up as much room space as a piano, and moving a keyboard isn’t nearly as difficult as moving a piano from room to room or location to location. They also don’t have to be tuned, as does the piano. Cost is also a factor when evaluating the two instruments. A good acoustic piano can be quite costly, and may not be affordable to many musicians. A keyboard, on the other hand, can range in price from $300 to $1,000, or less if you consider purchasing a used model.